If you’re a scientist or a time-traveling Roman centurion who speaks latin you might refer to it as Eremochloa ophiuroides. However, the common name most of us use is simply centipede grass and it’s a well-know variety occupying many lawns, parks, and schoolyards around the Southeastern United States. Tolerance to extreme heat makes this the perfect grass variety for the blistering summers we experience in places like Alabama and Mississippi. Provided your soil isn’t too alkaline, centipede grass can be extremely low-maintenance making it a landscaper’s favorite go-to in certain climates. When Should You Fertilize Centipede Grass? Centipede grass is considered a warm season variety. Most of the growth occurs in late spring and summer months. TIming really all depends on your area, but a good rule of thumb is to wait until the weather is warm but when the daily high is still below 85 degrees fahrenheit. Avoid applying fertilizer too early in the season and don’t use a product that contains broadleaf herbicides on new growth. Do your weed treatment after your centipede grass has had a few weeks of warm weather to mature. Be sure there is no danger of a late frost, and check with your local extension or co-op if you’re in doubt. How Should You Fertilize Centipede Grass? Probably the most important step is buying the right fertilizer for centipede grass. Phosphorus is a big no-no! You’ll burn your lawn to death if you just go to the local hardware store and pickup the wrong product. Of course, natural and organic is always the best choice and it’s practically impossible to burn your lawn with those products. Anything above a ZERO in that middle number is probably not a wise choice for centipede grass. 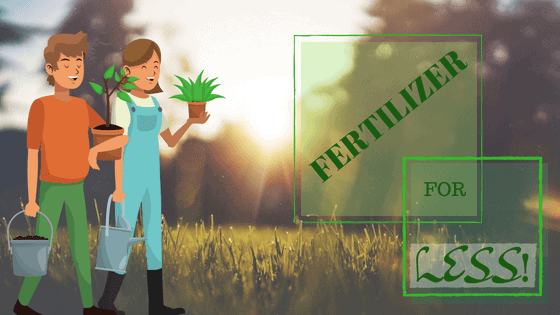 Fertilization rates are low compared to other grasses and you only need about one pound of fertilizer per 1000 square foot each year. I’d suggest splitting that into two applications or more to avoid burning. While you’re doing so it might be a good time to tear up a small piece of turn and check for white grubs that may be damaging your lawn. You can use a natural product like milky spore to control these pests without resorting to harsh chemicals.